One would imagine Ireland and Kerala have little in common - now more than ever, with the liquor ban in God's own country. However, one Billy O Foghlu has discovered a deep connection between the two places. One that goes back almost two thousand odd years. Music. 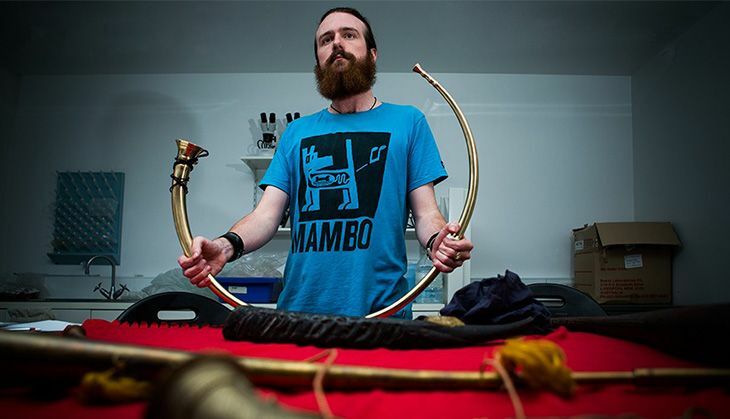 Canberra archaeologist and PhD student Foghlu has discovered a connect between musical horns from iron-age Ireland and similar traditional musical instruments in Kerala. Foghlu, who's from the Australian National University College of Asia-Pacific, published his findings in the Journal of Indian Ocean Archaeology recently. One major discovery comes in the form of a carving of a celebration in Sanchi that can be traced back to circa 300. It shows a bunch of musicians (supposedly European) playing two European carnyces, a horn with an animal's head, alongside other locals from the region. The carnyx is an instrument that goes as far back as the Iron Age in Western Europe, approximately found between 300 B.C.E. and 300 C.E. It's basically a five to six-foot-long brass tube which is topped off with an animal head. How did it land up all the way in Kerala? Trade routes. "I was astonished to find what I thought to be dead soundscapes alive and living in Kerala today. The musical traditions of south India, with horns such as the kompu, are a great insight into musical cultures in Europe's prehistory. And, because Indian instruments are usually recycled and not laid down as offerings, the artefacts in Europe are also an important insight into the soundscapes of India's past," Foghlu said in a release. The kompu is a C-shaped horn, a common sight across Kerala especially during festivals. Much like the European carynx, it produces a dissonant sound. "This was previously assumed to be evidence of shoddy workmanship. But in Indian music this kind of dissonance is deliberate and beautiful," said Foghlu and added that, "Some almost identical instruments have been unearthed together, but they are slightly out of tune with each other to western ears. Horns are used more as a rhythm instrument, not for melody or harmony in a western sense." In this interview of Foghlu's you'll find him playing the horn in question. Foghlu isn't new to work on musical instruments, especially horns. Last year in September, he 3D-printed a replica of an Irish iron-age artefact in order to resuscitate ancient Irish musical traditions. That replica, previously thought to be a spearbutt was, as Foghlu pointed out, more of a mouthpiece from an iron-age horn. He had said then, "These horns were not just hunting horns or noisemakers. They were very carefully constructed and repaired, they were played for hours. Music clearly had a very significant role in the culture." Clearly, it isn't the only culture where horns have played a crucial role.